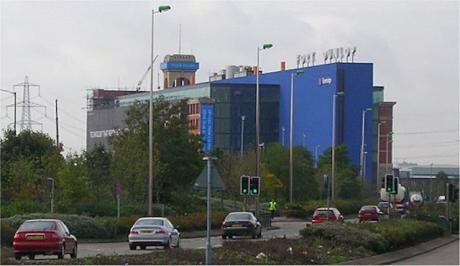 Fort Dunlop tyre factory, Birmingham, under development into a hotel and offices, 2006. Wikicommons/Oosoom. Some rights reserved. In the forthcoming book, ‘Our City: Migrants and the Making of Modern Birmingham’, crowdfunded by Unbound, Jon Bloomfield has interviewed fifty migrants to Birmingham from all walks of life: a mix of first and second generation; men and women; from Ireland to India, Pakistan to Poland, the Caribbean to Somalia who talk frankly and with humour about their experiences both at work and in society more generally. In this second extract, he meets the migrants who, jostling with poorly-qualified locals, work at the low paid and casual jobs rife in the Birmingham area. Ashraf lives in a long line of red brick, narrow-fronted terraced houses. Tall and slim, we sip tea in his living room, where the front door opens straight out onto the pavement. There are a row of streets here that stretch in parallel lines down to the main road that slices its way through inner city Sparkbrook. This used to be the heart of manufacturing Birmingham. The former Birmingham Small Arms factory was based at the bottom of the road, which in turn became the main centre of motor-cycle production in the UK. Those days are long gone, along with most of the indigenous white working class that used to live in these Victorian terraces. Today, the owner occupied houses are full of people originating from the Indian sub-continent and their children, along with more recent arrivals from the Yemen and Somalia. A few Irish remain. Ashraf’s mother lives across the road from him, while two other brothers live further down the street. Ashraf’s parents came from the Mirpur area of Pakistan. His dad arrived in the 1960s and was employed as a steel worker in Sheffield and went back and forth to Pakistan. At the time lots of people were coming to the UK from Pakistan, many re-located because of the Mangla Dam, so his dad saw the chance to earn money and do better for his family. That was the reason for emigrating. He saved money on housing by living like many other migrants in shared accommodation. As soon as the night shift finished, they would swap beds with the day shift. House sharing meant a lot of mattresses on the floor. In 1977 his mother got her visa and the family settled in Sparkbrook. His father got a job at the Fort Dunlop tyre plant where his manufacturing career continued until he was made redundant in the mid-1980s. Ashraf was born in 1977 in Sparkbrook. He went to the local nursery, junior and secondary schools. His father died while he was still at school and he and his eight siblings were brought up alone by his mother. Education wasn’t the priority at the time amongst kids of his age unless the parents pushed you. His mother came from a rural, peasant background so there was no strong pressure on him to get on. He went to the local technical college but lasted only four months. The first generation of post-war migrants to Britain had played their part in Britain’s post-war manufacturing revival. Ashraf’s dad was one amongst many: he had worked in steel plants, foundries, brickworks and then a big tyre plant. The Thatcher era saw the wholesale demise of vast swathes of these manufacturing giants. From 1971 to 1984 Birmingham lost over 200,000 manufacturing jobs. The era of stable, steady, semi-skilled manufacturing jobs in large plants and factories drew to a rapid close. Their sons and daughters either looked to the white collar service sector for jobs, which usually required some examination qualifications or else they applied for the 3D jobs: the dirty, the dull or the difficult, the type of jobs that nobody else was that keen on doing. There have always been low paid and casual jobs in the economy. It is just that a more casualised, non-unionised, de-regulated economy generates more of them. They are a growing feature of twenty-first century Britain. Carers, cleaners, cooks; van drivers, delivery drivers, taxi drivers; fruit pickers and food processors; packers and shelf stackers; waiters and washer-uppers; security men, porters, warehouse staff: many often working long hours, usually at the minimum wage, sometimes with irregular shift patterns and increasingly on zero hours contracts. These jobs are rife within and around the Birmingham area. They require few qualifications, are relatively easy to access and often require only a short CV. In the city 17% of the working age population have no formal qualifications, the highest figure of all English major cities and way above the national average. These are the types of jobs where many migrants are to be found, jostling with poorly-qualified locals. This chapter looks at migrants’ experiences in a number of these areas. The assured, steady manufacturing jobs of his father’s era had gone. Instead, Ashraf has had to find a series of 3D jobs in order to earn a living over the last twenty years. He started working as a labourer, followed by a stint as a lacquer sprayer. He did some packing where there was decent money, followed by security work at the Pallasades shopping centre in town. He then had seven years as a mini-cab driver which he liked but ‘was very, very flexible’ on hours. A spell of unemployment followed. He now works as a delivery driver for Asda. His wife is careful with money; she’ll start looking for work soon once their youngest is at school. For the future he would like to be self-employed again. He likes being independent, so he is looking to start a small business but he won’t go straight into it. He’ll try to start slowly and build it up. Ajay had come to the Midlands from India. When his small clothing business failed he got a job at the Post Office as a casual worker. That was his foot in the door. After two years, he got a proper job with them at the main Mailbox sorting office in town. The work wasn’t too heavy. He was sorting parcels and letters. It wasn’t boring but it was relentless – lifting, checking and shifting with a manager looking over his shoulder all the time, supervising what he and the others were doing. The basic pay was low but he made it up with overtime. They moved workplace twice and both times he went with them. The office then moved again to Daventry, which would have involved a lot of commuting each day. Ajay felt this would be too much for him, especially after long shifts so, after fourteen years, he took early redundancy. He found a temporary job shifting goods in a big warehouse at Hams Hall on the edge of Birmingham and then found work as a driver for Ring and Ride as part of the Special Needs service provided by the West Midlands Transport. He did that from February 2004 for the next ten years until his retirement. Ring and Ride was a better job, as he found driving a bit easier and there was no manager looking over his shoulder. The pay wasn’t high – £250 a week by the time he finished – with no overtime. Looking back over forty-five years of work, once his clothing business had failed, he had done a series of manual jobs, none of them well paid, but he had grafted hard enough to look after and bring up his family and earned enough for him and his wife to now have their own house in one of Birmingham’s outer suburbs. 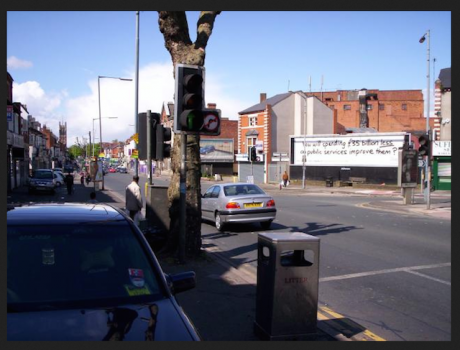 Stratford Road, Sparkbrook, Birmingham, 2006.